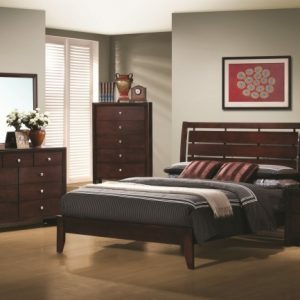 Providing a refined statement of Mid-Century modern design to your trend forward bedroom is the Minato Collection. Supported by a wide bracket foot and featuring oversized graphite grey hardware, the case pieces, including the lower profile dresser, stand as functional and unique accents to the dramatically distinct curve of the bed. Cathedral-grain cherry veneer with a mid-tone brown cherry finish further complements the design of the Minato Collection.